Chris's Plumbing Service offers a wide variety of septic tank services including drain fields, lift stations and restaurant grease trap cleaning. 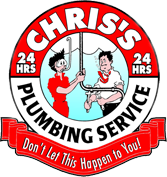 Chris’s Plumbing offers a full line of services for residential, commercial, and industrial customers. We’re there to meet your needs 24 hours a day. Not only do we sell parts at our warehouse, but we have the available staff on hand to handle all your plumbing needs. Need any plumbing fixtures? Stop by our showroom, our well trained staff can easily find the product you need! We have are suppliers of Plumbing Fixtures and parts. Visit our Showroom or call and ask for Tony.